The Second Burial Ground of North Andover was in use in the North Parish between 1817 and 1850. There are over 700 people laid to rest here, although there are only markers for less than half of them, as many stones have been lost over time. Some families had whole plots for interment, most had an individual gravestone. This cemetery is currently undergoing preservation supported by a generous grant under North Andover's Community Preservation Act. Opened in 1817 when the Old Burial Ground began to run out of room, the Second Burial Ground served as the final resting place for all the citizens of the North Parish of Andover until the establishment of Ridgewood Cemetery in 1851. Burials were not officially cut off for the First Burying Ground until 1830. Photo source: Barbara Fallon on Find a Grave. 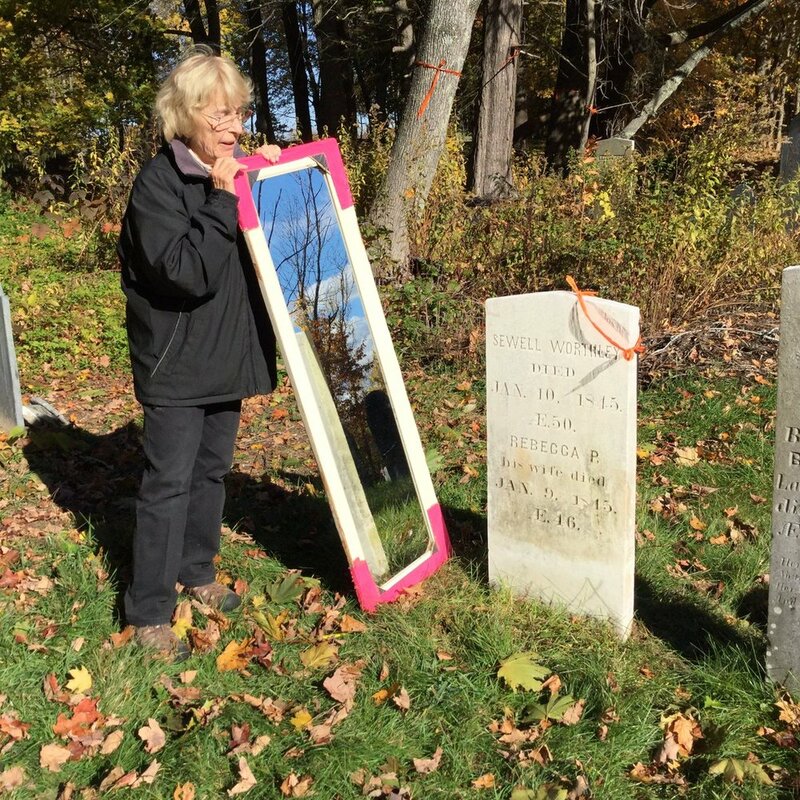 Using the sun and a mirror to dry freshly cleansed gravestones at the Second Burial Ground. Jim busy with preservation efforts in the Second Burial Ground. This cemetery is referred to as GR6 Second Burying Ground, in North Andover in the "Vital Records of Andover Massachusetts to the end of the year 1849." The Massachusetts Historical Commission refers to this cemetery in MACRIS as NAD.801 1817 Burying Ground.